Do you have the right ones at home? As far as kitchen essentials go, a well-chosen cutting board is one of our number one essentials, alongside the proper knife for the task. And while it might seem like a simple tool, there are a few qualities you should keep in mind before purchasing this bit of kitchen kit. Some quick tips on cutting boards before we dive into our selection. If possible, try to have separate cutting boards for separate types of foods. At the very least have one for raw meats, one for cooked foods, and a small board for strong smelling items such as garlic, onions, etc. Look for a board that is bigger than your largest chef’s knife. Lay your knife in the centre of the board, crosswise. You want there to be room on either end of the board around the knife. This board will be big enough to allow for ease of movement while chopping. My favorite trick when using a slippery cutting board is to fold a tea towel so that it sits squarely and neatly under the board. This will level out an uneven or warped board (which can happen to plastic chopping boards after frequent dishwasher cleanings), keeping the board from moving while you are chopping and preventing any accidents. Wooden boards are an aesthetically pleasing option, great for both chopping and also using as a serving platter (make sure the board is clean). Unlike a plastic board, wood needs to be washed by hand and can’t be put in a dishwasher. Look for a board that is a solid piece of wood rather than a composite, as these are less likely to split. 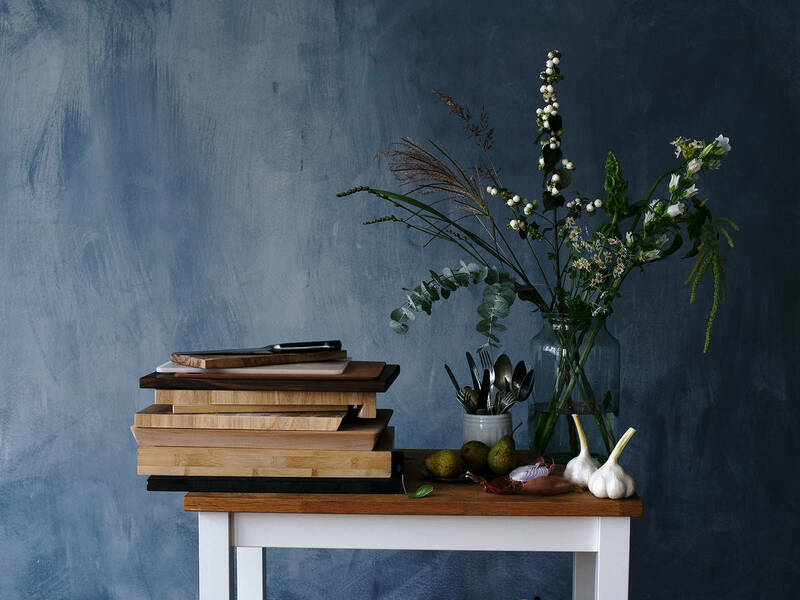 Because wooden boards are more porous—staining and retaining liquids more easily—they are best used for kneading bread, chopping vegetables and fruits, or mincing herbs. Plastic boards tend to be a more cost-effective and sanitary choice, as they are easier to keep clean, either by throwing in the dishwasher or soaking and scrubbing with hot, soapy water. You can also use baking soda or half a lemon and salt to scrub and deodorize the board. While less attractive than the wooden board, they are ideal for chopping raw meats, seafood, or more odorous foodstuff, like garlic and onions, that could be absorbed into a more porous wooden board. Hot, soapy water and a sponge is the easiest way to keep cutting boards clean. If you have a dishwasher, plastic boards can be cleaned easily in one (but remember: keep wooden boards out). To do a natural, but deep sanitation of your wooden board after cutting raw meat or seafood, first spray it with a mixture of 1/2 cup apple cider or white vinegar and 1 cup water. Let sit for 10 minutes, then generously spray the board with 3% hydrogen peroxide and let it sit for 10 more minutes. Rinse and let dry completely, then lightly oil the board to protect the integrity of the wood. Remember, cutting boards wear out like everything else. Replace them once they get grotty. Worn out cutting boards, especially those full of grooves from knife marks and indents, become a breeding ground for bacteria that make them tough to clean properly. So remember these helpful tips the next time you need a new cutting board! What’s your favorite cutting board material or brand? Tell us in the comments!